Understand your rights, obligations, and responsibilities as a Canadian employer. Today 25% of the Canadian workforce is aged 65 to 75 – in other words, at or close to retirement age. As this percentage increases over the next decade, employers will increasingly need to address issues related to older and long-service workers. What is the legal definition of retirement? What is the difference between a retirement and a resignation? What obligations does an employer have with regard to terminations? How do employee age and length of service impact an employer’s obligations? What policies and practices mitigate an employer’s financial and operational risks? 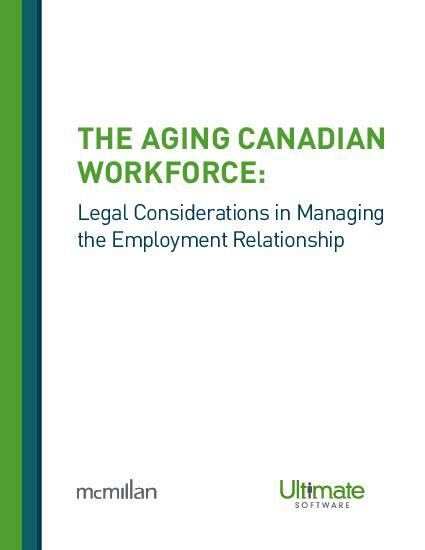 Please fill out this brief form to learn more about the aging Canadian workforce.